I receive a lot of innovation-type newsletters in my inbox. I love being inspired by new ideas and clever things that other people are doing. And this week ended with a real corker – Living Books. A new public library in Surrey, Canada has come up with the brilliant idea of offering people ‘on loan’ – so you can book in for a coffee and a chat with a volunteer expert to bring your reading experiences to life. Apparently this idea was born in Europe. Google, unusually, is being a little obtuse and I can’t find out exactly where but there’s a bit of talk about some ideas in the UK here and here. It has already been implemented in a couple of other libraries in Canada but I thought it was a great way of bringing interaction, connection and community spirit back to life in this overtly digital age. One of my favourite movies is You’ve Got Mail. 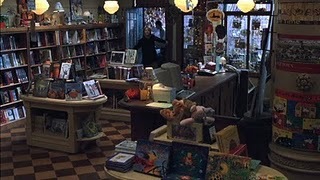 The Shop Around The Corner is just wonderful and I love the magic that Kathleen Kelly creates there in her enduring passion for books and reading. Libraries are suffering as we, in this age of cheap consumerism, buy books and dispose of them at will, or even worse cannot maintain levels of concentration beyond a snippet in a newspaper or a piece of celebrity gossip in a magazine. On the other hand, I went to my local library about six months ago and was disappointed with the whole experience of both browsing and the reading ‘ambience’, which did not really encourage me to sit and read anything. I think it’s inspiring to find public services that seek to create relevant experiences for current and future generations to engage in. I just hope the word spreads to encourage other libraries to think a little differently before public libraries are consigned to the realms of nostalgic rememberings. 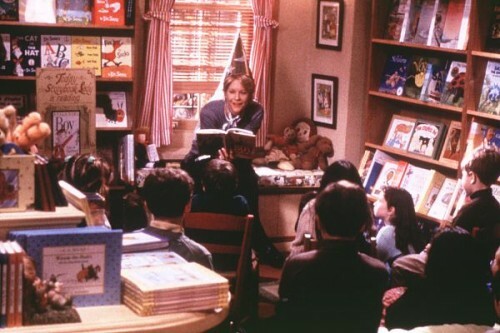 This entry was posted in having my say, Inspired by, movies and tagged libraries, Living Books, movies by Kym Hamer. Bookmark the permalink.